Dr. Muzammil H. Siddiqi is the imam and religious director of the Islamic Society of Orange County, Garden Grove; he also chairs the Fiqh Council of North America and the Islamic Shura Council of Southern California. Siddiqi has previously lled the Religious Affairs Committee of the Muslim Students Association, Department of Religious Affairs at the Muslim World League Office to the UN and the United States, Islamic Center of Washington, D.C., and Islamic Society of North America. He is also a founding member of the World Economic Forum's Community of West and Islam Dialogue (C-100). Siddiqi is a frequent participant in interfaith events, authors commentary and issues fatwas through the internet hub IslamOnline.net, and lectures widely on Islamic law. 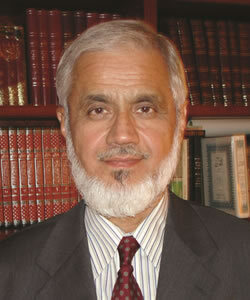 Siddiqi was one of the signatories in October 2007 of A Common Word Between Us and You. He is a graduate of the Islamic University of Medina, Birmingham University, and Harvard University.